The Candy Buffet Company is what no other candy buffet company can claim to be – truly unique. While our competitors have their eyes on us, we have our eyes on you and your event. But how exactly are we unique? The Candy Buffet Company is the original candy buffet supplier – hundreds of rivals owe their designs to the creative genius of our professional stylists. No other provider maintains the same level and commitment to customer service. From initial enquiry to post-event follow up, experience the difference. We know the horror stories of our relatively new industry. We are the experts in the industry; we’ve been here from the beginning! Why We Are The Very Best Candy Buffet Company Around! Contact The Candy Buffet Company today, to receive information on the perfect solution for you. Making your event unique can be a challenge, but The Candy Buffet Company is dedicated to presenting an original lolly bar design that matches the theme and mood of your event. 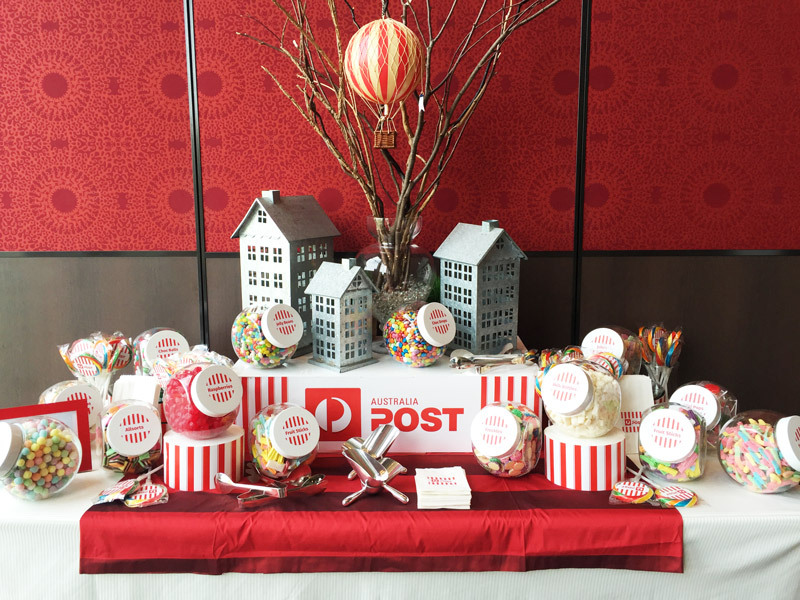 Candy buffets can be bright and child-like or sophisticated and decadent – whatever the requirement, you can rest assured we can supply a lolly buffet to match. The child-like wonder it creates in your guests – your guests literally are “kids in a candy shop!” – with a lolly bag to fill with goodies! Sweets you haven’t eaten for years are available – gob-stoppers, baci balls, humbugs and rock candy, you name it we’ve got it! The Candy Buffet Company provides a combination of classic and contemporary lollies housed in stunning apothecary glassware with lolly scoops that smack of yesteryear. Our tablecloths are also specially selected to ensure that the candy buffet serves as the perfect backdrop to your event. Even if your party has no set theme, our design experts are ready with plenty of suggestions to ensure that the candy buffet suits your event to a tee. Contact The Candy Buffet Company – our lolly buffet design experts can explain the options which are most suitable for you. Candy buffets are perfect for any event – weddings, birthdays, kids parties, anniversaries, corporate events, product launches, movie nights, bar mitzvahs, bat mitzvahs, and yes, even at a wake. Provide a little of the unexpected for your next corporate event with a candy buffet. Designed to match your company colours or your event theme, a candy bar will create the atmosphere you are looking for. Your guests will graze throughout the night or scoop up a sample as they head home for the night. However you would like the lolly buffet presented, you can be sure that it will be a talking point for all of your guests, both young and old. We even create custom company candy products for your employees or distinguished guests. Your guests have wined, dined and danced and for many weddings, the function has run out of ideas. Roll out the wedding candy buffet! Guests of all ages will flock to it, cackling away as they fill their lolly bags or lolly boxes with forbidden goodies. And when you ask anybody the next day what they remember most (besides the beautiful bride), we guarantee it will be the candy buffet. See what our brides have to say! We recommend the candy buffet hold pride of place upon your guest’s arrival – as the party unfolds, you can watch as people begin to hover over the candy buffet, desperate to get a taste of some sweet, sweet love. If yours is a kids party, don’t even bother trying to hold the kids back! Let them pack their own lolly bag that they can then collect at the end of the party. And as for the theme, be it “Under The Sea”, “Super Heroes”, “Hollywood Rockstar” or “Halloween”, The Candy Buffet Company will supply a lolly buffet to match. We are dedicated to providing the most elegant, yet fun candy buffet available, to ensure your guests leave your event with a smile! Get a free price quotation to determine if a lolly buffet that is right for you. See a recent blog on one of our team members here.